On Dec 13, 2007, I called my dad to wish him happy birthday. He talked about how he must have food poising because of how bad he felt. Two days later, my mom took him to the hospital to see what was causing the vertigo and slurred speech. They first thought it was an inner ear infection, but after running tests, diagnosed him with a one inch tumor in the back of his brain & two other tumors in his lungs. They advised immediate brain surgery as he was just days away death. He has “stage 4 squamous (non-small cell) cell lung cancer”. On Christmas Eve, my dad underwent surgery to remove the brain tumor. The doctors were not sure he’d survive the surgery, so treating the lungs was irrelevant at the time. Since then, he’s had at least 75 doctor appointments, 5 weeks of daily localized radiation on the brain, then chemo on the lungs, and now 5 more weeks of radiation on the lungs. For a couple of months, every week was filled with more and more unfavorable news... He developed blood clots in his leg that broke loose and went to the lungs, he came down with pneumonia, they found a fracture in his back, and was even diagnosed with sleep apnea. I find comfort that God is the One to determine timelines for life and health, though the stats from some of the doctors are bleak, we are optimistic that he’ll pull through. By God’s grace, he is making small steps of progress. I (Howard) am without a car until I can find a replacement. Laura drove my car since she left the kids at home with me so she could attend a monthly SV women’s meeting. She was waiting at a red light. The light turned green. Laura pulled out. And WHAM! She got side-swiped by a guy who ran the red light. Fortunately she was not hurt, but my car was totaled. 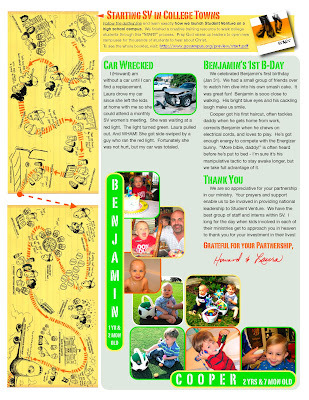 We celebrated Benjamin’s first birthday (Jan 31). We had a small group of friends over to watch him dive into his own smash cake. It was great fun! Benjamin is sooo close to walking. His bright blue eyes and his cackling laugh make us smile. Cooper got his first haircut, often tackles daddy when he gets home from work, corrects Benjamin when he chews on electrical cords, and loves to play. He’s got enough energy to compete with the Energizer bunny. “More bible, daddy!” is often heard before he’s put to bed - I’m sure it’s his manipulative tactic to stay awake longer, but we take full advantage of it. We are so appreciative for your partnership in our ministry. 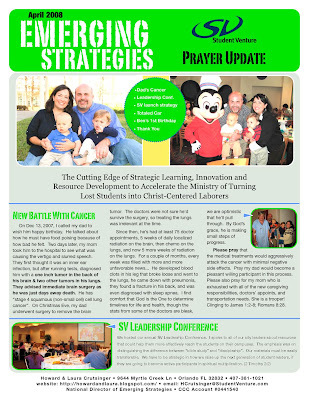 Your prayers and support enable us to be involved in providing national leadership to Student Venture. 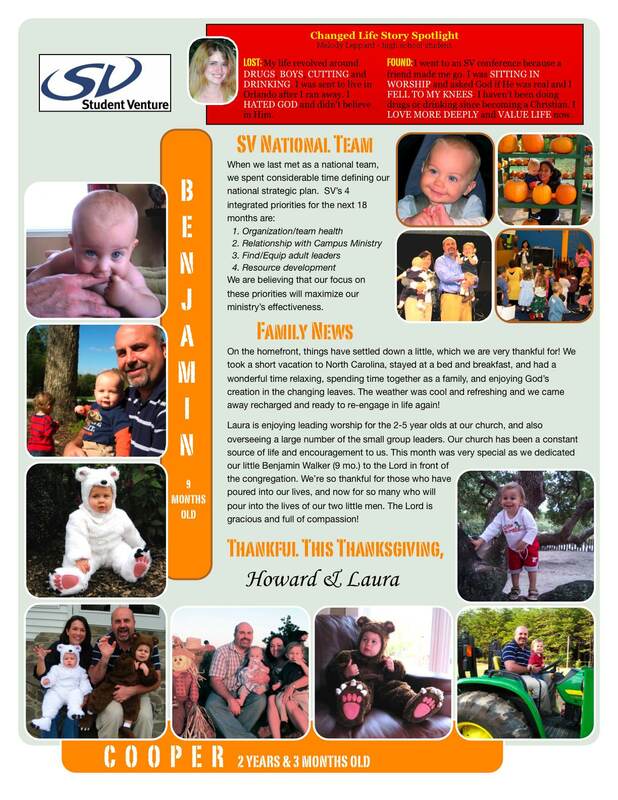 We have the best group of staff and interns within SV. I long for the day when kids involved in each of their ministries get to approach you in heaven to thank you for your investment in their lives!